- The information is based on relative prevalence of genetic lesions in the various tumor phenotypes, and suggests that the sequence of mutations leads to cancer formation. - or maybe a fortutious finding at ultrasound of the neck. - there may be difficulty in breathing. - but in rare instances the tumor can produce enough hormone to cause hyperthyroidism. - Carcinoma of the thyroid characteristically appears as an assymetrical lump in the gland. - If it is still within the confines of the gland, it will move with the gland when the patient swallows and may be moveable within the gland. - rapidly growing lesions may sometimes be soft or even fluctuant. - lesions may undergo necrosis and discharge through sinuses that develop in the skin of the neck. - and about 70% of those found in children. - The lesions are multicentric in 20% or mre of patients, especially in children. - It has been demonstratedby molecular genetic techniques that multiple foci often originate from separate oncogenic events, and are biochemically distinct. - Using rigid pathological criteria, perhaps 2/3rds of predominantly papillary thyroid cancers are found to have follicular elements. - The natural history of these lesions is similar to that of pure papillary lesions. - This tumor tends to be indolent and may exist for decades without killing the host. - Papillary carcinoma tends to metastasize lacally to lymph nodes and occasionally produces cystic structures near the thyroid. - or the lung fields may have a snowflake appearance throughout. - These tumors are amazingly well tolerated and may allow relatively normal physical activity for 10-20 years. - At times the pulmonary metastases are active in forming thyroid hormone, and may even function as the sole source of hormone supply after thyroidectomy. - The metastases may progress gradually to obstructive and restrictive pulmonary disease. - In the past decades, follicular carcinomas comprised up to 50% of thyroid malignancies in the Europe. - more likely was due to histological misclassification at the time when the follicular variant of papillary thyroid carcinoma was not recognized as papillary but rather as follicular. - it is a slowly growing tumor and frequently is recognized as a nodule in the thyroid gland before metastases appear. - Variation inthe cellular pattern ranges from an almost normal appearing structture to anaplastic tissue that forms no follicles or colloid. The insular variant of the follicular tumor tends to be more aggressive. 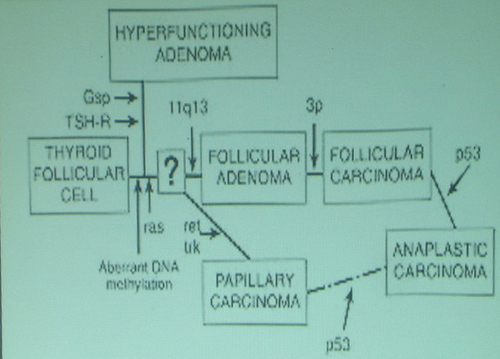 - At operation about 1/2 to 2/3rs of these tumors are resectable. - Tumors that are small tend to be less lethal than those actively infiltrating local structures at the initial operation. - Local adenopathy, which is uncommon does not appear to carry a greater risk, but extensive invasion of the tumor capsule and thyroid tissue increases mortality. - Local direct invasion of strap muscles and trachea is characteristic of the more aggresiive tumors. - Resectablility depends on this feature, and death may be caused by local invasion and airway obstruction. - The "minimally invasive" variant has a far better prognosis than the highly invasive variant. - Follicular carcinomas tend to invade locally and metastasize distantly. - rather than to local nodes and are especially prone to metastaisiz to bone or lung. - Bony metastases are usually osteolytic, rarely ostoblastic, and the alkaline phosphatase level is rarely elevated. - The tumor and metastases often retain an ability to accumulate and hold iodide and are therefore sometimes susceptible to treatment with RAI (radio-active iodine). - Indeed, some metastatic tumors synthesize thyroid hormone in normal or even excessive amounts. RAI tharapy, improves survival in these patients. - Occasionally the primary lesion of a follicular tumor appears to be entirely benign, but distant metastases are found. - Invasion of vessel or the capsule, apart from the metastasis, is the only reliable criterion of malignancy. - This variant has been called the benign metastasizing struma or malignant adenoma. - It has a more prolonged course then do other varieties of follicular tumor, and is the type that has offered the best oppurtunity for the therapeutic use of 131I. - The net extra mortality attributable to follicular cancer in the 10-15 years after diagnosis is 30-50% of the patients dying from the lesion, 3/4ths do so from the effect of distant metastases and the remainder from locally invasive disease. - occur predominantly in persons over 50 years of age and constitute and increasing proportion of lesions in eachsubsequent age decade. - of great interest is the pathologic evidence that such tumors arise in perhaps half of the cases in a long-standind benign lesion or in undifferentiated carcinoma. - Spindle cell and most giant cell carcinoma of the thyroid grow rapidly and are very invasive. - These tumors metastasize to lymph nodes both locally and widely, but not characteristically to bone. - Pulmonary metastases are frequent. - By the time diagnosis is made the disease has spread in most patients beyond the area that can be attacked surgically and they die within 6 months to 1 year. - At a few, perhaps 10% of these tumors are entirely resectable when first discovered. - Lymphomas of the thyroid gland represent less than 5% of primary thyroid neoplasms. - The mean age at occurence is 62 years. - Primary lymphomas of the thyroid are two to three times more common in women than in men. - Unlike most other thyroid neoplasms, lymphomas usually appear as rapidly enlarging masses and local symptoms are common. - many patients note pain, hoarseness, dysphagia or stridor. - Hoarseness is often present in the absence of vocal cord paralysis. - rarely, patients may have the SVC Syndrome. - Melanomas, breast tumors, pulmonary tumors, gastric , pancreatic and intestinal carcinomas, renal carcinomas, lymphomas, carcinomas of the cervix, and the tumors of the head and neck may metastasize to the thyroid. - Sometimes the first indication of one of these tumors may be the appearance of a lump in the neck. - unless there is eveidence for a primary site elsewhere, these tumors are easily mistaken for explaining tumors that have their origin in the thyroid gland. - Usually by the time metastases appear in the thyroid, other metastases have occured and the primary lesion may be discerned.